This recipe comes to you via Karen and my time spent in Lebanon, learning cooking techniques and going back to the roots of our family’s heritage. This recipe is a compilation of many ideas regarding the falafel and, believe me, everyone has their opinion on this classic Middle Eastern dish. One thing you can count on is that it is a crowd pleaser. So enjoy my version of this wonderful dish while sharing this recipe with family and friends like Karen and I do. Lebanon is famous for their wine making techniques and vast vineyards. However, it is next to impossible to find these wines in Northern Nevada. That being said I recommend a Bordeaux blanc, or a domestic Sauvignon blanc. Enjoy, Enjoy! Soak chickpeas overnight. Then bring to a boil, reduce heat, simmer for 3 hours. Then drain and rinse. Drain and rinse the chickpeas. In a meat grinder or food processor, pulse the chickpeas, jalapeno peppers, onions, garlic cloves and cilantro together, so that they are grinded but not into a paste. If you’re using a food processor, you’ll have to do this in several stages. Mix together in a large bowl. Add the baking soda, flour, sesame seeds and spice mix. Mix well. Then add the chickpea mixture and mix again with your hands until everything is incorporated. (In this case mixing with your hands is essential.) Add plenty of salt to taste (at least a tablespoon if not more). When ready to fry, heat oil that’s at least 3 inches deep in a large pot, to 350 degrees. 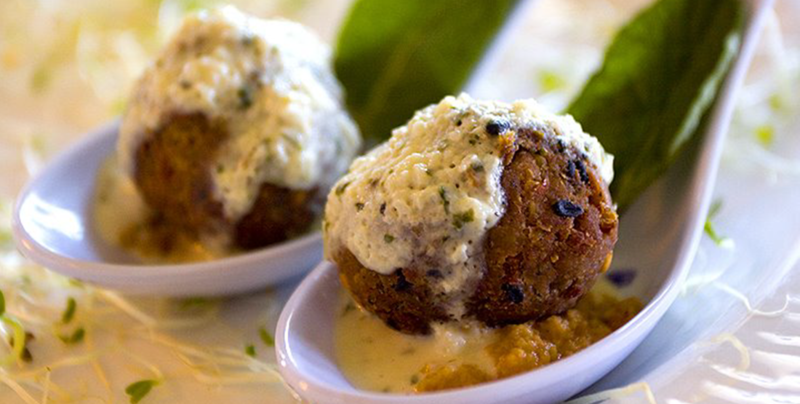 Tightly form falafel into balls or domed discs about an inch and a half in diameter. It’s VERY important that falafel be very tight, otherwise it WILL disintegrate in oil. If mixture resists being tightly formed add a little bit of cold water to mixture. Gently drop into the oil and fry until dark golden brown and crusty, about 3-4 minutes. Remove from oil, drain on paper towels. Place mint leaves in the bowl of a food processor. Roughly chop cucumber and jalapeno, and add to bowl, along with lemon juice. Put yogurt in a separate mixing bowl. Pulse the cucumber mixture until a slurry is formed. Gently fold into yogurt, and add salt to taste. It’s important to not add yogurt to the food processor, as the fats in the yogurt will break and result in a runny sauce. Spoon yogurt onto the falafel, falafel sandwich or falafel wrap . If you want a traditional falafel sandwich, you will need shaved lettuce, chopped cucumber, sliced radishes, and chopped seeded tomato; Serve in a Pita bread or as a Lavash wrap. Top with the Yogurt Tahini sauce. For a falafel variation find a recipe for a fattoush salad and add a falafel disc on top with the yogurt Tahini sauce. It’s a wonderful addition to an already great salad.